The Fellowship was fortunate enough to obtain a copy of INVISIBLE REPUBLIC #1 from Image Comics. Gabriel Hardman and Corinna Bechko write, Hardman draws and Jordan Boyd colors. Life on Avalon is getting harder since the Malory regime fell. But now people are starting to look back at the regime’s main figure, Arthur McBride. No one knows much about him, but when a reporter finds the writings of McBride’s mysterious cousin Maia, his worldview changes. And now he’s going to bring it all out into the light – the true motivations of the most dangerous man in recent history. Is historical science fiction a thing? If this book is an example of it, then I think it should be a thing. And this is Babb’s story, too (he’s the reporter), with his quest to find “the story” in all of the chaos and pain. The story is very much focused on people, and the art really shows that to us, along with a gritty realism. This writing team is well known for their cool science fiction. I think they’ve got another good one going here. Pick it up. 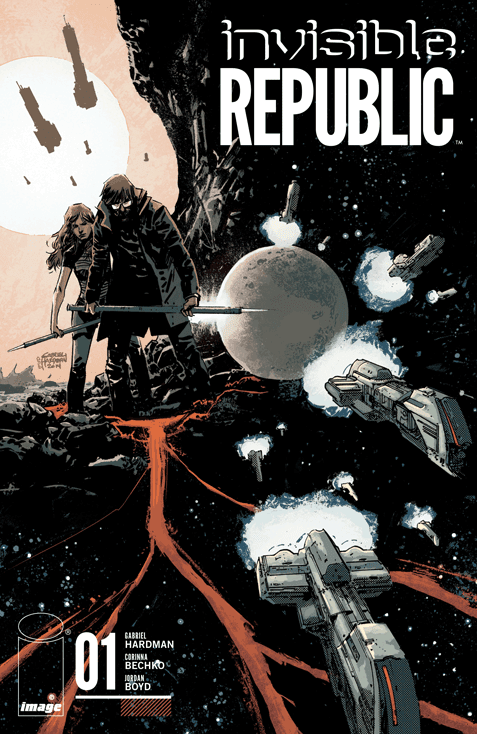 INVISIBLE REPUBLIC #1 is available now at your FLCS or at imagecomics.com.